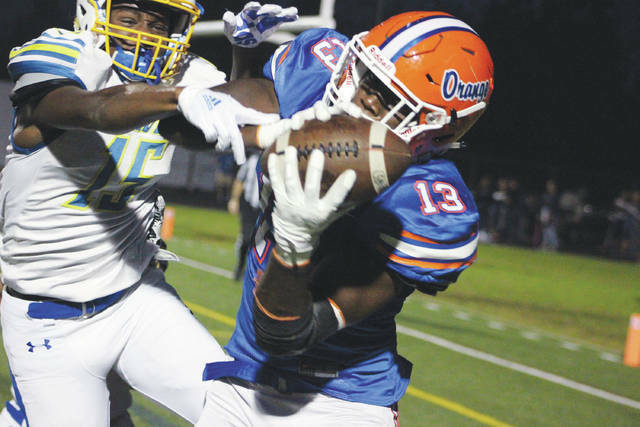 Orange’s Zach Harrison (13) hauls in a touchdown in front of Olentangy’s DeAnte Ables during a key OCC clash earlier this season in Lewis Center. Harrison, who had 14 tackles for loss and seven sacks in seven games this season, earned Delaware All-County Defensive Player of the Year honors for his efforts. Olentangy’s Luke Riedel was named Offensive Player of the Year. For the complete list of teams, see page 10.